UFO Hotel Room: The Newest Suite at the Treehotel is Shaped Like a Flying Saucer! Our favorite Swedish eco hotel has a new addition to their amazing selection of high flying rooms and it's shaped like a giant flying saucer! 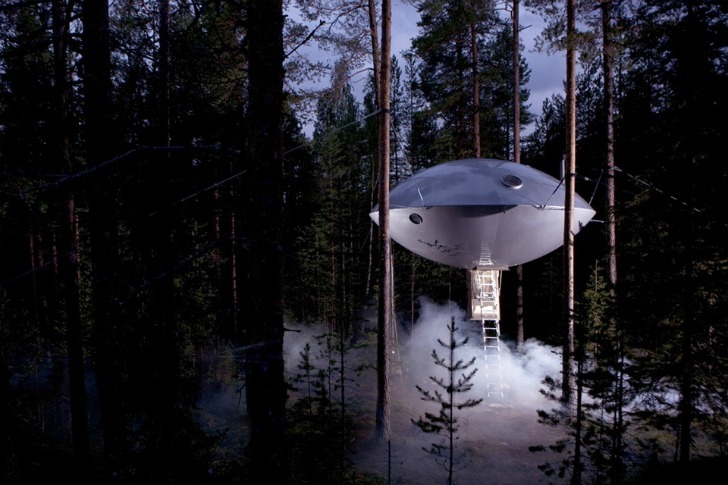 A UFO recently landed in the forests of the Treehotel letting guests imagine they were abducted for a night. Prefabricated from a lightweight composite material, the UFO is suspended in the trees and is sustainably built just like all of the other rooms. 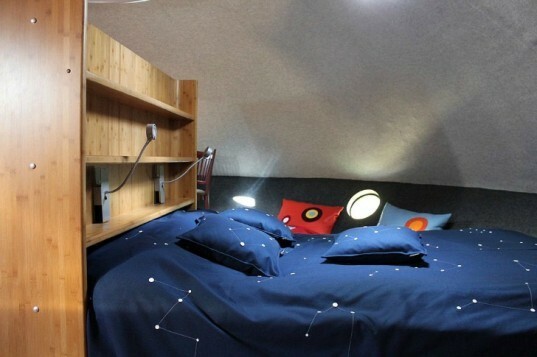 For $625 a night, you and a friend can kick back in your very own UFO, check out the aurora borealis and maybe even have your own sighting. The UFO was prefabricated offsite and then transported via roads to its final destination at the Treehotel in Harads near the Lule River. Cast in durable composite material, the UFO is super lightweight, but also strong and sustainable so it can easily be lofted in the trees. Accessed by a retractable staircase and a hatch door, the 30 sq meter room has enough space for a double bed, bench bed/couches on the perimeter, a composting toilet and a dining area. Porthole windows let guests check out the surrounding forest scene, while a giant round skylight pours natural daylight into the space and lets you see the nighttime sky above. The Treehotel has a strong commitment to the surrounding environment and works to run their establishment in the most sustainable way possible. All of the rooms were built by local companies to minimize impact on the site and are hung in a way that does not harm the trees. Environmentally safe materials were used in the rooms’ construction and they all feature insulation, underfloor heating, LED lighting, water efficient fixtures, and composting toilets. The hotel sources its electricity from hydroelectric power and uses only eco-friendly cleaning products. Originally opened in the summer of 2010, the hotel now has six completely amazing rooms in which you can stay. The hotel was also recently awarded Sweden’s Grand Tourism Award for 2011. I love this. is it suspended by cables? The UFO was prefabricated offsite then transported via roads to its final destination at the Treehotel in Harads near the Lule River. Cast in durable composite material, the UFO is super lightweight, but also strong and sustainable so it can easily be lofted in the trees. Accessed by a retractable staircase and a hatch door, the 30 sq meter room has enough space for a double bed, bench bed/couches on the perimeter, a composting toilet and a dining area. Porthole windows let guests check out the surrounding forest scene, while a giant round skylight pours natural daylight into the space and lets you see the nighttime sky above. The Treehotel has a strong commitment to the surrounding environment and works to run their hotel in the most sustainable way possible. All of the rooms were built by local companies to minimize impact on the site and are hung in a way that does not harm the trees. Environmentally safe materials were used in the rooms construction and all feature insulation, underfloor heating, LED lighting, water efficient fixtures, and composting toilets. The hotel sources its electricity from hydroelectric power and uses only eco-friendly cleaning products. Originally opened in the summer of 2010, the hotel now has six completely amazing rooms in which you can stay. First glimpse of the UFO room nearing completion. The UFO in route to the Treehotel. Early plans and floorplan of the UFO. Final floorplan of the UFO.